I know it’s been like 6 months since I went to New York, but I still have a few posts that I want to share with you, and I’m determined not to give up on this Travel Diary series half way through! Here is day 4 of my New York Travel Diary series: Empire State Building, the central library, the night tour bus and Ellen’s Stardust Diner. On day 4 we decided to get up early and go up the Empire State Building. It was about a 15 minute walk from our hotel and fortunately for us it was another beautiful day. It was probably the hottest day of our entire trip. 🗽 Top tip: If you are going to go up the Empire State Building, go as early as possible (like 8am) as you won’t have to queue. Pros – Open at the top for the full “I’m on top of the world” feeling, and better for taking photographs. Also, it’s just a classic. Cons – Not the tallest building in New York. Gets very busy. Can’t take an iconic photo of the Empire State Building (duh). Pros – Tallest building in New York and the western hemisphere. The lifts are an experience in themselves. More space and places to sit. Less queues. Cons – Entirely inside. Not as good for photographs. The other option of course is to go up the Rockefeller centre, but I can’t really comment on this one because I’ve not been to the top. Maybe next time?! 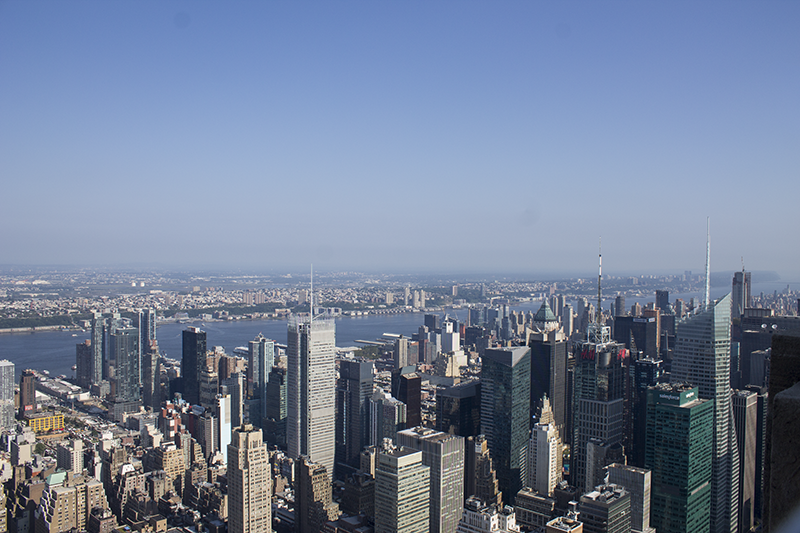 After we’d been up the Empire State Building, we popped to Dunkin’ Donuts for breakfast. It’s funny because we have a Dunkin’ Donuts in Liverpool but I’ve never been! But it’s great for a quick and cheap breakfast on the go. Tyrone insisted we get large iced hot chocolates, of which we only managed to drink half of because, my god, they were huge! Because it was so hot we headed to Bryant Park just to chill out in the sunshine and try to plan out the rest of the day. At this point I was wishing that I had worn a dress rather than a jumpsuit because it was so hot. I was glad that I had packed sun cream with me. We were both absolutely shattered from the previous two days, so we decided to take day 4 a little bit slower. We planned to rest at the hotel in the afternoon and then go on the night tour bus in the evening. On the way back to the hotel, we popped in the New York Public Library. I’d seen it from the outside a few times but I really wanted to go inside and see if it was just like it was in the movies. And honestly, it was more beautiful than I imagined. It’s free to go into the library, so I highly recommend you pop in if you’re nearby. After an afternoon of rest at the hotel, we got ready to head out to catch the night tour bus. The night tour bus is run by the Big Bus company; the same tour company we used on day two of our trip. This was the final time that we used our New York Explorer Passes. We had to pick up the bus from just outside of M&M World in Times Square. Even though we arrived early, there was a massive queue. We were concerned that we wouldn’t get to sit on the open top deck of the bus but the staff reassured us that they had loads of buses so that everyone had the opportunity to sit on top. We managed to get on the second bus. The bus heads Downtown but takes a different route to the Downtown tour bus that runs in the day. You then cross over the Manhattan Bridge into Brooklyn, go around in a big circle, and then head back over into Manhattan to head Uptown. The whole route takes about an hour and a half to two hours. Our tour guide played “New York, New York” by Frank Sinatra as we head back into Manhattan and I couldn’t stop smiling. New York is just so incredible! I highly recommend this tour bus if you want to see New York all lit up at night but at the same time you want to rest your legs because you’ve over done it in the day! As soon as we got off the bus we dashed over to Ellen’s Stardust Diner for some food. We were starving! After visiting Ellen’s Stardust Diner during my last New York trip I knew I had to go back. Basically, it’s a classic American style diner, but all the staff perform for you. Like, they’re incredible singers. They have to audition to work there, and every year the diner loses some of their staff to Broadway shows. In fact, it was our waitress’s last shift at the diner that night because we had landed herself a role in a show! How amazing is that! You have to queue to get into Ellen’s but it’s worth the wait. After half an hour of waiting we were still really far down the queue, but then a member of staff came down looking for a party of two. Fortunately for us, everyone else in the queue seemed to be in big groups, so we got to jump the queue! So satisfying. Best of all, the table for two was downstairs, where all the action happens. Tyrone was terrified, especially as the staff danced on the back of the seats right by us! But it was so entertaining and I didn’t stop smiling all night. I think Tyrone secretly enjoyed it too! Stick around for a post about Day 5 of our trip to New York, when we walked acrossed the Brooklyn Bridge and ate all the pizza! I promise you wait have to wait several months for this post! ← The Weekend Blog | Hey, 2018! You looked like you have a lot of fun in New York! I wanted to go at least once to NY just to see what’s the hype all about lol. It’s definitely worth the hype, haha! I’m still really bummed that we weren’t able to meet. I think it would have been so awesome but my health is the worse. Seriously, you make NYC look so glamorous! Your photographs look fantastic. You have probably done a lot more in NYC than I ever have and I was born and raised there. I have been to the top of the Rock, though. The view is outstanding. It was a little bit scary to me because the walls are just sheets of glass. But if you’re not terribly afraid of heights like I am, I think you should definitely go the next time you visit =). I’m sure I will return to New York soon and then we can meet up! Thank you. 😊 New York is such a beautiful city to photograph, especially when the weather is so amazing. I will definitely have to go to the top of the Rock next time I’m there! Looks like you went up the Empire State Building on a good day! You got such a beautiful clear view! That’s also a good idea to do a tour at night. I love seeing the city at night, and resting your legs on a tour bus sounds like a nice way to end the day. I’ve never been to Ellen’s Stardust Diner, but that looks like a fun place to eat! How cool that the staff actually has to audition to work there! Yes, we had better weather than the day we went up One World Trade Center! Last time I was in New York I didn’t beat the jet lag and I rarely stayed up past 6pm, so I didn’t get to see the city all lit up. I’m so glad I got another chance to enjoy the city at night. I’m kinda laughing that this post was written “late” but to me it doesn’t feel like it and at the same time I have a heap of posts to write about some of my travels. 😂 It was really lovely to read this though, because Nick and I are planning a trip to the States this July, and New York is definitely on the list. I’ve heard the top of the Rock has a great view. I’m actually not super interested in going to the top of the Empire State Building because I’d rather get a photo or see the building itself from another building. And yeah I’ve heard about the crowds and I’m not sure if it would be worth it for me! Ooo I’m so excited for you going to the States! I’m sure you will love to New York. I feel like there is something for everyone there. I think I’m going to have to go back to New York just to go to the top of the Rock! Haha yes! We actually found the portion sizes to be quite varied. Some places were average, but fast food restaurants tended to give massive portions.